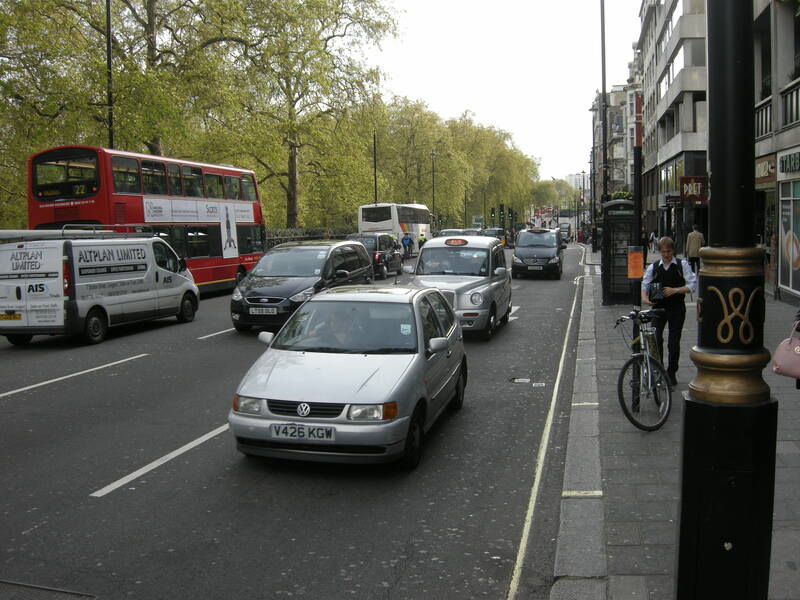 ← Love London, Go Dutch – Safety In Numbers? A surprisingly common response to the idea of creating Dutch-style cycle tracks on some of London’s roads is that the construction of those cycle tracks stands, somehow, in conflict with the goal of civilizing our city streets. This view is characterized in a variety of ways, all of which have something in common. Give drivers their own segregated space “unpolluted” by cyclists, then they will drive faster and with less due care and attention. Putting in cycle tracks and then banning cyclists from the carriageway is like putting in guard railing. Another view is that cycle tracks represent a ‘carving up’ of public space; the creation of yet another stream of traffic, taking up yet more room in areas of our city that could and should become ‘places’ instead of straightforward transport routes. At best, this space is taken from the private motor vehicle; at worst, it is taken from pedestrians. And a final argument maintains, broadly, that cycle tracks miss the point; what we should really be aiming for is a civility of environment. We should be ‘taming the traffic’ by removing gyratories and flyovers, and creating spaces that can be shared safely by everyone, without having to segregate vulnerable users away. The creation of cycle tracks alongside roads, or around these gyratories, is, in the long view, a pointless distraction from this fundamental goal of motor traffic reduction. that civilized environments in our cities – places, instead of traffic routes – are incompatible with the construction of cycle tracks, which simultaneously create routes for lycra-clad warriors to bomb down, and do nothing to tame or calm the flow of traffic on the road itself. 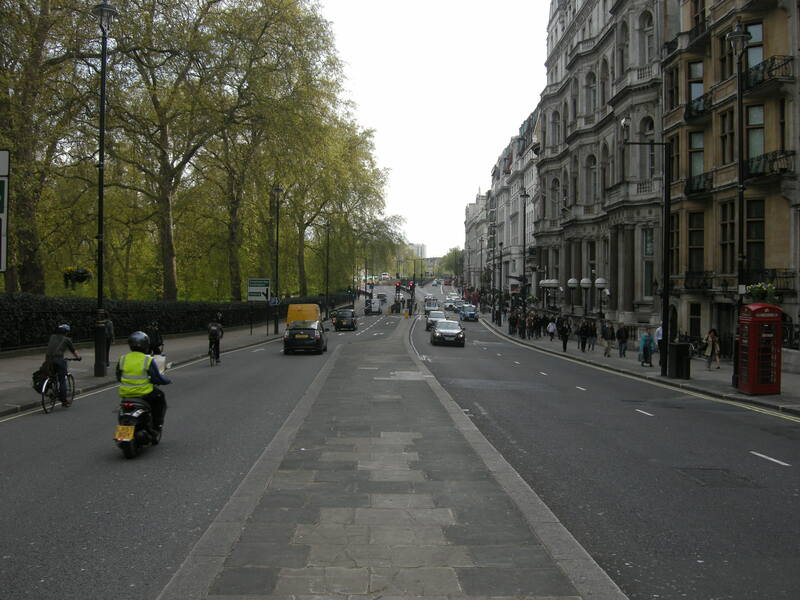 Of course, in a London stripped entirely of motor vehicles, cycle tracks would not be necessary. The space on our streets could be shared equitably between cyclists and pedestrians. Indeed, putting in fast cycle tracks on some of these pedestrianised streets would doubtless encourage some rapid, anti-social cycling incompatible with a civilised street environment. But this is, to put it bluntly, fantasy land. London is a thriving city, and large vehicles, however much we can dream about their removal, will still need to move around in it. Buses are perhaps the most obvious example. Likewise, deliveries will still need to be made, and the size of those delivery vehicles can only be reduced so far before it becomes uneconomic. Nor do I think it is feasible to ban the private car from London – some (note, some) car journeys are essential, and will remain so. We can, of course – over the long-term – unwind the transport mistakes of the last half-century; for instance, removing flyovers when they start to crumble, instead of rebuilding them. We can also turn many of our streets that are currently horrible routes for vehicles into civilised places, by closing them off to through traffic. But although they may, ideally, be greatly reduced in number, routes for vehicles around London will continue to exist; indeed they will have to, if people are still going to get around by bus, and shops, factories and offices are still going to need to be supplied. To take one example, the route of the LCC’s Big Ride on Saturday 28th April ran along Piccadilly. It is not conceivable – to me at least – that this road could ever become motor traffic-free. Buses will run continue to run along it, into and out of the West End. Likewise lorries and vans will continue to use it, in order to access buildings in central London. This is not a road that could, realistically, be civilised by the simple expedient of removing the traffic. Cycle tracks will be necessary along this road for subjectively safe cycling. If you want to argue that, with traffic continuing to run along this street, then the Mall (for instance) could be closed to vehicles, I wouldn’t try and stop you, and nor would I argue against you when you suggest that cycle tracks would not be necessary there. But streets like Piccadilly – those streets which will have to continue to carry vehicles, unless we are proposing some kind of utopia – will need cycle tracks. There is plainly plenty of space here. It just needs to be reallocated, away from vehicles, and given to pedestrians and cyclists. Doubtless, with fewer private motor vehicles making journeys into central London the capacity of the road could be reduced, down to a single carriageway in either direction. The civility of the road would be increased, with wider pavements and a smaller road. If you make the bicycle a pleasant and safe alternative to the private car, doubtless this reduction in road capacity would barely be noticed, because more people would be riding bikes, in addition to those using the tube and buses. And of course putting in cycle tracks does not mean that the road space itself has to be ‘surrendered’; there are plenty of measures that can be put in place to calm motor traffic, without necessarily having to keep cyclists in the same space. Putting in zebra crossings, creating narrower traffic lanes and removing the central reservation are all potential measures, among many others, for keeping traffic speeds and behaviour under control. On other streets – those streets that may not be necessary as routes – it is of course possible to tame vehicle traffic in other ways, principally by street engineering, or by making them difficult to use as through routes, or by banning their use by certain categories of vehicle, or indeed removing vehicles completely. This has already happened on many streets in London, and in other British towns and cities. One suitable treatment for these kind of vehicle-reduced streets is ‘shared space’, broadly defined as the removal of delineation between carriageway and footway, and of ‘standard’ street furniture such as signs, with the aim of mitigating the sense of ownership felt by any particular road user, and consequently creating a greater civility of behaviour. Naturally enough, shared space would no longer place cyclists out of the motorists’ way; drivers would have to interact with cyclists, and with pedestrians. Likewise, it is quite the opposite of the ‘carving up’ of public space represented by cycle tracks. All road users share (or are supposed to share) the same space, on an equal footing; there would be none of the compartmentalization of ‘pavements’, ‘cycle tracks’ and ‘road’. The message that should be sent out by these kind of designs is that the street is no longer a route, but a place. I have written quite extensively about shared space before, principally making the point that it is only an appropriate solution on a particular category of street, one where motor vehicle traffic is sufficiently low. We should not become confused into thinking that shared space, simply because it works in some low traffic environments, can be transferred and applied to any street in London. This is the mistake that has been made in Byng Place in Bloomsbury, and on (the northern section of) Exhibition Road in Kensington, where the extent of genuine sharing is minimal, principally because the volume and speed of motor traffic is still high, and there is very little in the open space that necessitates restraint in the way that vehicles are driven. Daniel Moylan, the now outgoing Deputy of Transport for London, apparently believed that shared space was applicable as a treatment on nearly every single road in London as a ‘civilising’ force, an opinion which flies in the face of how the current shared spaces in London work. But unfortunately, because shared space is a Dutch concept in origin, it might prove remarkably easy to crowbar it in as a Go Dutch ‘solution’ on streets that remain busy with vehicles, and not just on those quieter streets where genuine sharing is much more likely to work. In other words, applying the ‘Moylan’ solution to civilising streets, instead of taking a genuinely Dutch approach. It’s all about encouraging respect and shared use. 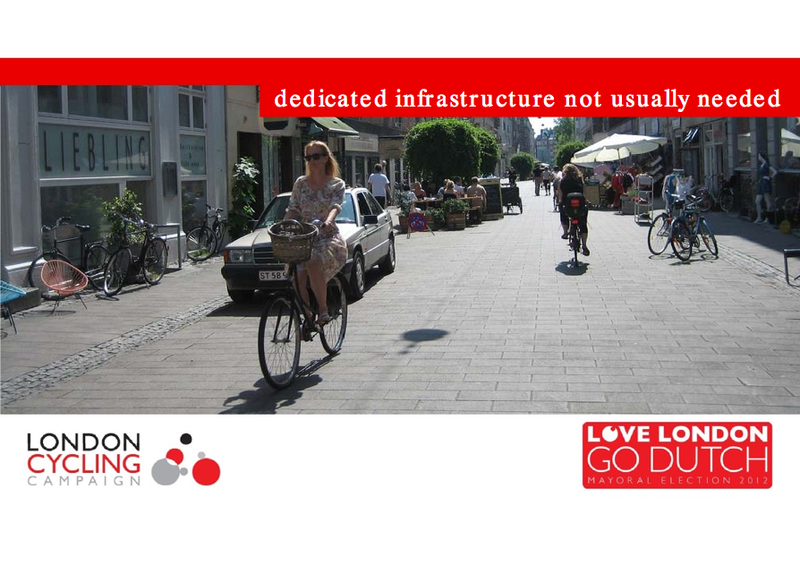 For the London Cycling Campaign, we’ve promoted ‘Go Dutch’ – again focusing on shared space. The idea is that all road users have equal priority. The goal is not just the improvement of road safety, but greater thoughtfulness, inclusivity. Shared space is actually rather rare in the Netherlands, and where it is found on slightly busier streets it is deeply unpopular with Dutch cyclists. This is not to say the shared space cannot be a part of ‘Going Dutch’, merely that it should not be seen as a ‘solution’ on the main roads that were the focus of the LCC’s campaign. The principles that must be adhered to involve segregated bike tracks where motor traffic is heaviest, and in other areas removing through-traffic and creating shared-space. Of course we don’t always need dedicated infrastructure… Shared space is all the rage at the moment, or shared surfaces, or naked streets, or all of those things, are all the rage at the moment, and actually, looking at that picture, I can see why. The picture is quite obviously a very low traffic environment, somewhere where shared space can, and should, work. But I don’t think Richard made sufficiently clear that this is a very different class of street to that which would require infrastructure. Shared space is not a substitute for cycle paths. Those busier streets that will still carry buses and commercial vehicles are not an appropriate environment for ‘sharing’, and the LCC should hold firm to the principles they have outlined of segregating bicycles on these main routes. As I have argued, such a policy can go hand in hand with civilising these environments, and does not stand in conflict with the goal of motor traffic reduction, or removal, on those quieter streets that can be turned into ‘places’ where cycle tracks will not be necessary. This entry was posted in Go Dutch, Infrastructure, LCC, London, Pedestrianisation, Shared Space, Street closures, Subjective safety, The Netherlands, Transport for London. Bookmark the permalink. Great blog, wanted just to come back on the comment regarding Forster getting the wrong end of the stick, as I’m the person who wrote the newsletter entry you refer to. Bad editing on my part in our newsletter as we certainly weren’t promoting the concept of shared space as the only technical solution to improving the conditions for cyclists on London roads, merely using it as one example of a growing trend for co-operation and sharing we are seeing across a number of the campaigns we run and that we would love to promote more, so we can move away from the adversarial approach that still holds sway. For me personally, dedicated and high quality segregated provision for cyclists is the main thing we need if we are serious about making cycling mainstream, but we need to take the non-cycling community (i.e. the vast majority of people) with us, so we cannot afford to be overly didactic about it, which means a horses for courses approach depending on context and usage. Thanks for commenting, Peter. I’m glad it’s just an editing glitch. You’re right about needing to take people with us – I think ‘Go Dutch’ has to be part of a broader movement to civilise London, and should obviously be about calming streets to turn them into ‘places’. Much of Soho, for instance, is unnecessarily traffic-orientated. That said, cycle tracks can and should be part of the solution on those busier routes. Like you say, it’s horses for courses! When you show pictures of Piccadilly like that it’s difficult to understand why some people think there is “no space” for cycle infrastructure! As you correctly point out the current road network and it’s perceived required capacity is based on peoples current (and expected when forecasting forward) transport habits. It seems these models are incapable of making the obvious leap of subjectively safer cycling (via infrastructure or other means)=more cycling=less private car use=less space needed for cars. This doesn’t even take into account a potential relief in public transport costs, more reliable journeys for those who DO need to use the road network or the improvement in air quality and general health of the population. I’m sure someone also did once make the analogy of mixing motorised traffic and bikes and our current governments pre-occupation with training (predominately for the vulnerable, with the much harped on about £15m) as being akin to letting lions roam around in a kids playground and just giving the kids chairs and lion taming lessons to deal with the danger. This would seem like a completely illogical thing to do for just about anyone but isn’t far short of what the current proposed “solution” is by not dealing directly with the source of danger. Unfortunately I suspect without bringing back in the road user hierarchy, re-doing the “smoothing traffic flow” initiative to take into account for those on bikes or (rather optimistically) adopting the principles of sustainable safety very little will actually change. Which is a terrible shame as I’d love to be able to go out riding wherever I want in our country with my children without fearing for our safety in the same way I can do with a car. The problem stems, I think, not from forecasters’ (i.e. TfL) lack of imagination but from an ideology that exists higher up the food chain. An ideology that sees a person choosing to reach central London by Tube, on a bike, on foot or in an SUV as morally 100% equivalent, and as nothing more than a neutral exercise in free choice. It’s this way of thinking that is far more toxic and damaging than any single policy of Boris’, or any single non-implementation of a Ken policy. It’s hard to make progress until the powers that be are capable of getting it through their heads that unnecessary car use in a city centre is anti social behaviour – in fact, anti social behaviour of a not dissimilar kind to playing loud music in the small hours, public urination etc.. it would seem Boris & his gang are blind to the fact that each individual vehicle in the road represents an incremental rise in air pollution & road danger, and that overusing a finite, scarce, public resource (road space / road network capacity or indeed public transport capacity) is inherently selfish & antisocial. Either that, or they know full well, and are pretending otherwise for political gain. Angus is absolutely correct. I can’t understand why so many campaigns are only locally-focussed when the Department for Transport should really be the target. The reason that the road markings and signs and bus lanes and crappy cycle lanes are identical across the UK is because all councils are just following the DfT guidelines. When designing a road, they look in the book and follow the rules. If we want any real change, it must come from above. People riding bicycles shouldn’t be used to tame motor traffic. It’s unethical to deliberately put people in the way of potentially lethal equipment as a means of controlling such equipment. I’m sorry, i just disagree with everything you ate saying, from my perspective. What we need is a legal framework that makes killing a cyclist a minimum of manslaughter, with an automatic presumption of guilt on the driver of a motorised vehicle. Cycle lanes would jolly soon become an obsolete idea! All the true dangers of using a road are still present when you follow a cycle path except that the motorists forget you are there at junctions and are more likely to knock you down not less. All your aims of incresing the uptake of cycling are very laudable but I’m sorry, cycling is transport for me, not a Sunday afternoon leisure activity! The problem is that every driver is a “good driver”, and it’s only “the other drivers” that crash and kill and injure people. So fear of being charged with manslaughter would have very little effect, as no driver expects that they’ll crash. The dangers are not from the road, they are from fast-moving motor vehicles. If you have one and a half tonnes of metal and glass travelling at 30mph or more, then getting in its way is always going to be dangerous. This is shown sadly too often by experienced cyclists who are “taking the lane” and wearing high-viz being killed by inattentive motorists. We also should remember that we already segregate pedestrians from motor vehicles on our roads. I doubt we would be able to remove all pavements from our streets simply by changing the punishments for motorists who kill. The Dutch have some of the safest roads in the world for cyclists and pedestrians, because they have implemented “sustainable” safety: the safety is generated by keeping motor vehicles well away from people, or slowing the motor vehicles to safe speeds, so that when people make mistakes they are not deadly mistakes. This approach is fully in line with Health & Safety best practice, where removing the source of danger, or keeping the danger physically separated from the humans, is proven to be much more cost-effective than relying on training and personal protective equipment. If UK roads were treated in the same way as a company workplace, they’d be closed to motor vehicles immediately as they are intrinsically unsafe. Training and PPE are only used as a last resort in H&S planning because they are the least effective interventions you can make. Fonant – mostly agree with you, with the exception that one of the things that makes workplace H&S effective is that the punishments for screwing up badly are draconian. Crashes are common enough that if every accident causing serious injury resulted in prosecution for GBH, word would soon get around. However, you could end up with unintended consequences – driver groups lobbying for more pedestrian cages, for example, to try and deflect liability away from themselves. On the contrary, H&S interventions are designed to make it impossible, or very difficult, to be injured. The whole point is that even with training and draconian sanctions for bad behaviour, people make mistakes. Systems, workplaces, roads, should be designed so that when people make mistakes, other innocent people don’t get killed. So show me the last cyclist taking a lane who got killed! And the main point I was making was that cyclists on parallel cycle paths are still grossly exposed to the risk of being hit around junctions. It is my belief that this risk is increased firstly due to the cyclists’ FEELING safe ( but not Being safe) and secondly by the motorists not seeing or caring about the presence of cyclists until they spring out at them around junctions. How is junction danger to be controlled? And regarding the sentencing of motorists who injure cyclists….I suppose you consider that the derisory sentences that do get given out sometimes discourage drivers from behaving badly around cyclists? Don’t make me laugh! Take your pick: http://www.stop-smidsy.org.uk/case-studies – Deliberately putting yourself in the path of motor vehicles is certainly a way to be seen/noticed more easily, but it’s very risky if the motorist just isn’t looking as they will then hit you. That’s easy to answer: do everything that the Dutch do: they have the safest roads for pedestrians and cyclists in the world, and they’ve refined cycling provision over the last 30 years so everyone feels safe, and is safe, cycling in the Netherlands. Roughly-speaking, 20mph limits for streets, segregated lanes with traffic lights or clear cyclist priority on minor roads, grade-separated junctions (bridges/tunnels) for major roads. No, I’m saying that whatever the sentences, drivers almost always think that they personally are a “good driver” and so won’t ever kill or injure anyone. Thus the level of sentencing is irrelevant to drivers. Drivers don’t go around killing and injuring because they know they can get away with light sentences. The injuries and deaths are always unexpected and unwanted, and I’d imagine that having the guilt of killing someone for the rest of your life is as much a nasty thing as spending time in jail. I hope this message doesn’t sound too confrontational! I’ve come across this viewpoint before, so I’m probably going to respond to more than what you’ve written. Let me guess, you’re a fairly healthy male in your 20s/30s/40s? Would you advise your mother to get on a bike and make the same journey as you do? What about your gran, or any young children in your family? If not, why not? All these ages cycle regularly in the Netherlands, for transport as well as leisure. Tiny changes in law will made no difference to the cycling numbers in Canada when strict liability was introduced, so I doubt they would here. No parent would let their child cycle along the road, thinking “well, if little Timmy gets killed by an inattentive driver then at least there’ll be a custodial sentence!” Even the best drivers make mistakes. Cycling in front of the best lorry driver in the world is always going to *feel* dangerous, and that’s what puts people off using a bike. The idea you’re suggesting is that we can increase bike use by showing non-cyclists some sleight-of-hand trick, giving them some handy tips or a statistic or two, but it’s just not going to happen. Until we have proper cycle infrastructure in the UK, to the same high standard that exists in the Netherlands, then riding a bike will always be a minority interest here, an extreme sport practised by enthusiasts. Why do so many cyclists think we can talk our way to mass cycling, even though this has been the mantra for 30 years without success? How people can see the cycling revolution that’s been happening in the Netherlands since 1975, and then come to the conclusion that we can keep on designing roads the way we do is crazy. Drivers don’t *want* to kill anybody, yet someone is killed on UK roads five times every day, and sixty-two people are hospitalised with serious injuries every day. Driving without due care and attention is already illegal, so why would yet another law make a difference? If we want Dutch levels of cycling, then we need Dutch levels of provision. There is no short-cut. I’m aware that I’m wittering on so I’ll stop now by saying that I’m glad you feel safe cycling into London, but until all men and women aged from 8 to 80 feel safe too, you’ll remain part of the 1%. There’s not much too add by way of response, given what David Arditti, Angus and Fonant have written. I would stress that, while I think the punishments for causing death and injury on UK roads are grossly lenient, it is unfair to suggest an automatic presumption of guilt in the case of a cyclist dying in a collision with a vehicle, certainly if the charge is to be manslaughter. The framework we have needs to be changed, but what you suggest would, for instance, result in a driver who happened to kill a drunk on a bicycle who rode straight across a junction into his path being charged with manslaughter, despite avoiding action being impossible. The other point I would make, touched on by David Arditti, is that cycle tracks are not just a way of keeping people safe (this is the argument that if cars were always perfectly driven, then cycle tracks would be unnecessary). They are, just as importantly, a way of making journeys convenient and pleasant. Perfectly driven traffic can be just as thunderous and intimidating to a cyclist as less well-driven traffic. Wyadvd seems to have thoroughly misunderstood. Everything on this blog is promoting cycling as transport, not as “a Sunday afternoon leisure activity”. But the point is that very few people will take it up as transport if it means they have to cycle with large volumes of motor vehicles on the roads. We know that from at least 40 years of trying to promote cycling on the roads as they stand. This blog regularly argues for better legal sanctions against dangerous and careless drivers. But what you are calling for, Wyadvd, would be unreasonable and unjust, and will never happen. It has not happened anywhere in the world. And even if, through legal means, “perfect” behaviour by drivers were assured, which it can never be, cycle lanes and tracks would still be needed to give cyclists space and priority in congested towns and cities. It is not just about safety, it is about the quality, efficiency and enjoyability of the cycling experience. These are the things that well-designed cycle lanes, paths and tracks, on the Dutch model, provide. Dutch cycle tracks are very safe at junctions, of course, far safer than UK road junctions without cycle tracks. Suffice it to say that I am speaking purely from a personal point of view. I am very much a vehicular bicycle driver who uses a busy dual carriageway every day and find it much safer than my alternative rural route home ( plenty of space for everyone on the dual carriageway). It also saves me about 20 minutes, which cannot be sniffed at! To be fair, I scoured the smidsey site and found not one reference specifically to a cyclist validly taking a primary position killed in a smidsey incident. Maybe I’m looking but not seeing! What’s missing from these exchanges is the acknowledgement that cyclists are not always perfect road users either. I don’t have a car and have used a bicycle as primary means of transport for decades – commuting, shopping, pregnant, with child on seat behind me, etc – and now more than ever want to follow my natural bent – careless, absent-minded and falling off from time to time. I could do this in Holland without courting death. I do think that was covered in one of the Dutch reports on sustainable safety. They accept the fact that humans are failable and therefore takes steps to seperate out different masses/speeds where possible to minimize the chances of serious accidents. In a typical accident involving large vs small it’s pretty much certain the smaller party will be worse off. I quite agree, and this is why Health & Safety experts have found that training and protective equipment are of very limited use: it’s so much more effective to make the environment safe. People often make mistakes, they are often inattentive, forget their training, take short-cuts, and are very fallible generally. In a safe environment that doesn’t matter at all.